Ozoo Inc., launch AutoRaid: RPG Manager, a new online CCG Strategy game. Game publisher Oozo Inc, makers of the acclaimed action RPG Brand New Boy, is ready to take the mobile CCG arena by storm. Combining elements of fantasy MMOs, Fantasy Card Games, and “manager” style simulation games, AutoRaid offers unparalleled depth in strategy, a compelling 2D aesthetic and powerful analysis tools. Analyzing the aftermath of a win is just as important as figuring out a loss. In AutoRaid, players crack packs of cards with characters that represent classic MMO roles—warriors, rangers, shaman, and more. From their cards, players create a team of five that they take into dungeons or the PVP arena. But this is just the beginning! AutoRaid is a game that rewards a deep-dive into its mechanics. Everything affects combat: the positioning of cards in the combat line-up, abilities, skill points, card rarity level, buffs and debuffs. With a deep understanding of the game, a once-insurmountable foe can fall easily. AutoRaid: RPG Manager, was originally published in Korea by Netmarble as RPG Manager in late 2013. 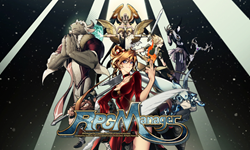 After more than 2 years of success in the Korean market, AutoRaid: RPG Manager is ready for its launch into the global market.